After years of designing with just paper my new found love of mixed media has now allowed me to combine my fiber art as well as my media art...swoon!!! I started with the image transfer technique using Gel Medium taught by the Fab Julie on our design team...video can be seen here. I printed these images from a CD filled with Vintage Victorian Clip Art and transferred them on. I focused on leaving exposed areas and areas torn away for a natural look. I wanted some more vintage brown tones with some elegance so I used my Gold Gelato stick and rubbed it into the edges of the transfer. I then added some vintage lace that had some beading on it...I found this lace amongst other vintage loveliness in my grandmother's belongings when she passed. I adhered it down with glue and Gel Medium. The Gel Medium was too thick so I watered it down to half water half medium so that it would soak through the lace into the paper. I then added some stamped text with Coffee Archival Ink. This ink is essential because water will not make it bleed!!! A must for Mixed Media!!! 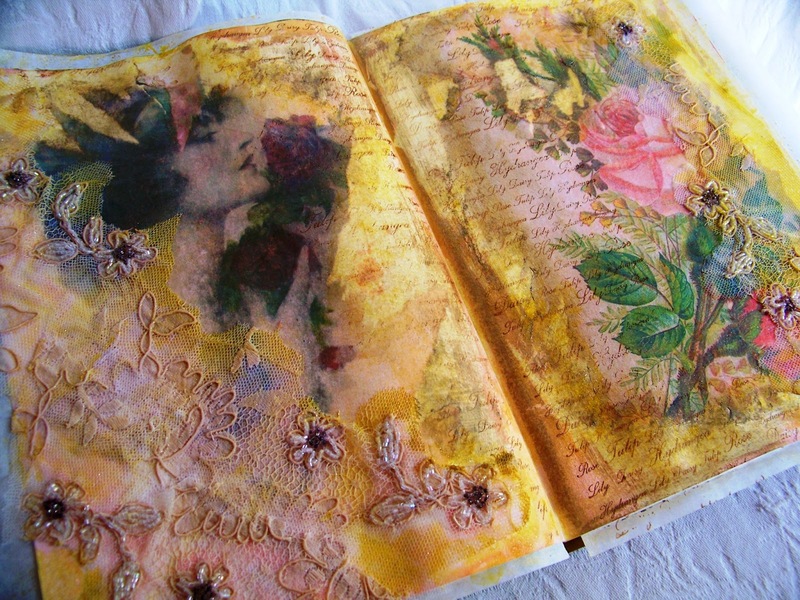 I thought the pages were getting too toned down so I added Gold 3D Stamp Paint. Not only did this paint pick up the color but it added a nice shimmer!!! The paint was a bit thick so I water it down and applied it with a very wet paint brush. I wanted more color and depth behind the lace portion so I added more color with my Splash of Color Silks Glaze Paints. These are awesome paints with great luster and True Color!!! I used Nutmeg and True Azalea. I spritzed them with a bit of water to help the colors blend. 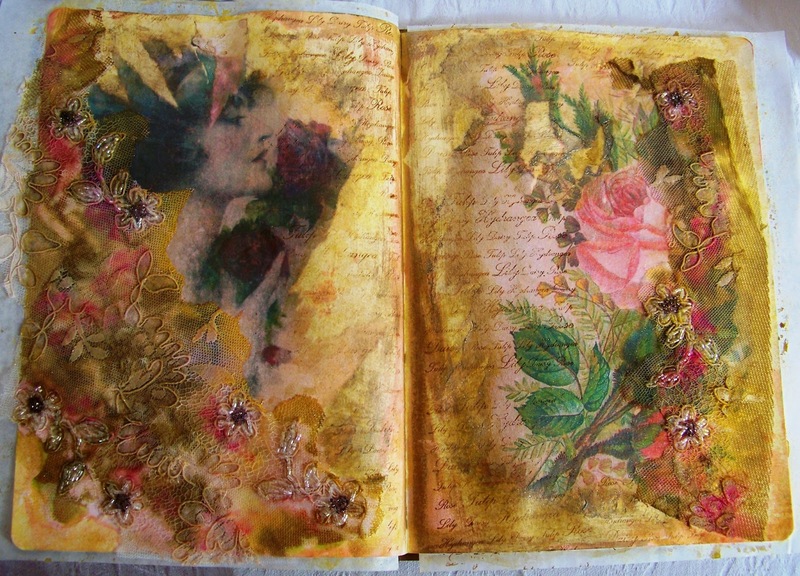 Here are the final pages...all dried!! It took a couple of hours for the Gel Mixture to dry with all this humid weather. My final addition was a stamped bird from an old Tim Holtz stamp set and Tim's Chit Chat Words for the sentiment. I also inked around the edges with Vintage Photo Distress Ink. 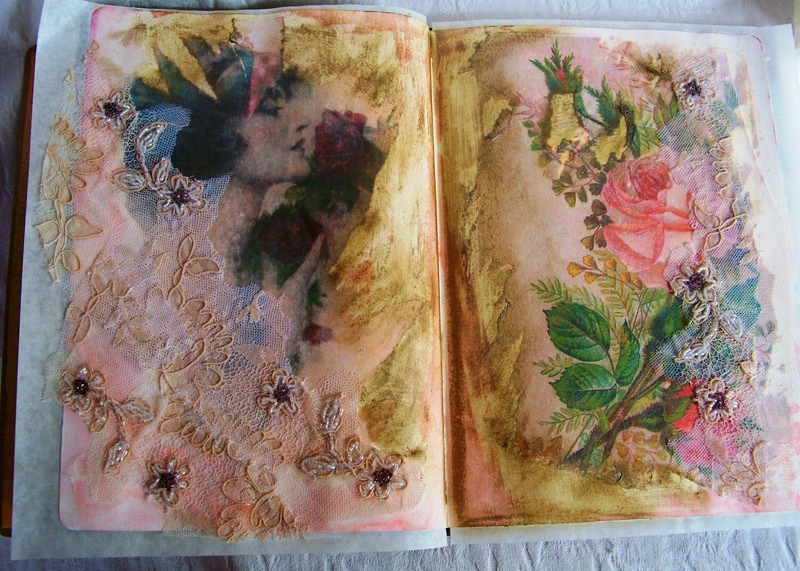 I hope you have some lovely fabrics that you can add to your journal pages...watered down Gel Medium works wonderful for adhering them...remember half water and half gel! Love this, Donna Marie! The combination of the vintage transfer and fabric is just perfect!! This is gorgeous & i really want to give this a try! Oh my goodness gracious this is so gorgeous. I have to copy you or I will certainly faint and fall out. I need to learn how to do this transfer stuff --- beautiful artwork!!! I am drooling all over my computer!! Wow!! All the texture and depth of the colors is amazing! wow, that is beautiful. I love how the gold added that vintage look. 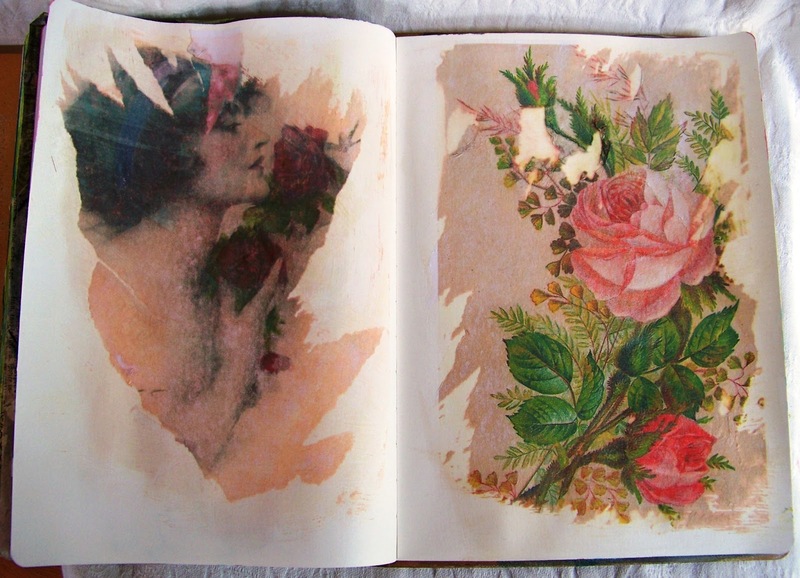 Donna-Marie, these pages are beautiful. 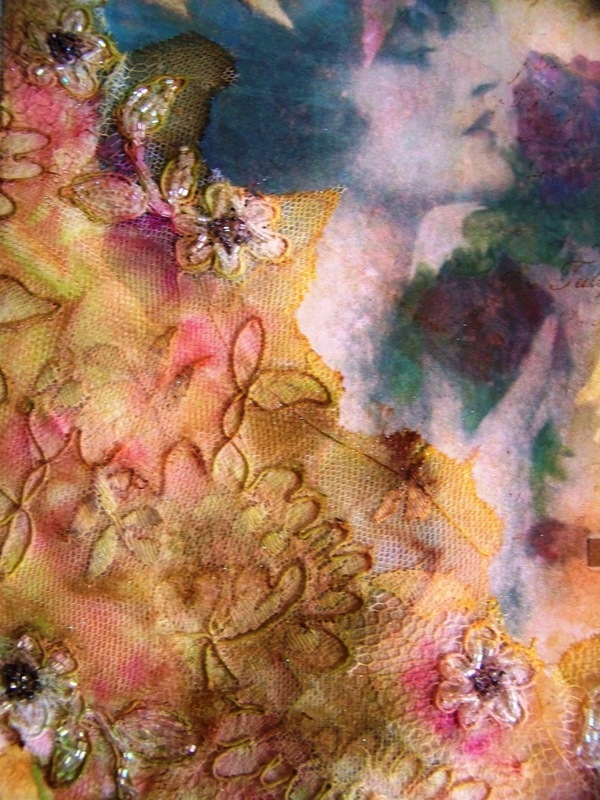 The image transfers turned out so well and blend so beautifully with that amazing fabric. 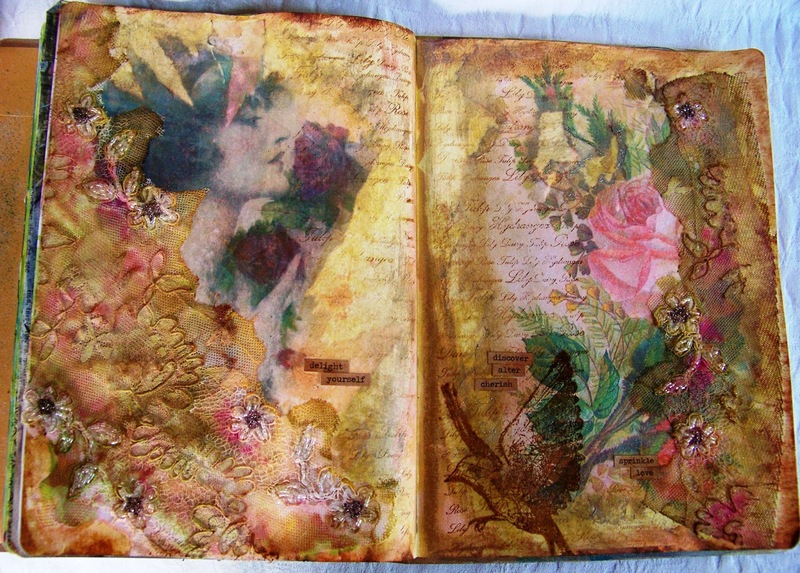 Love the colours you have used and the touches of gold. The stamped bird is a great detail as is the script stamping. Another beautiful project. Your talent amazes me. oh, Donna Marie, this is so very beautiful. 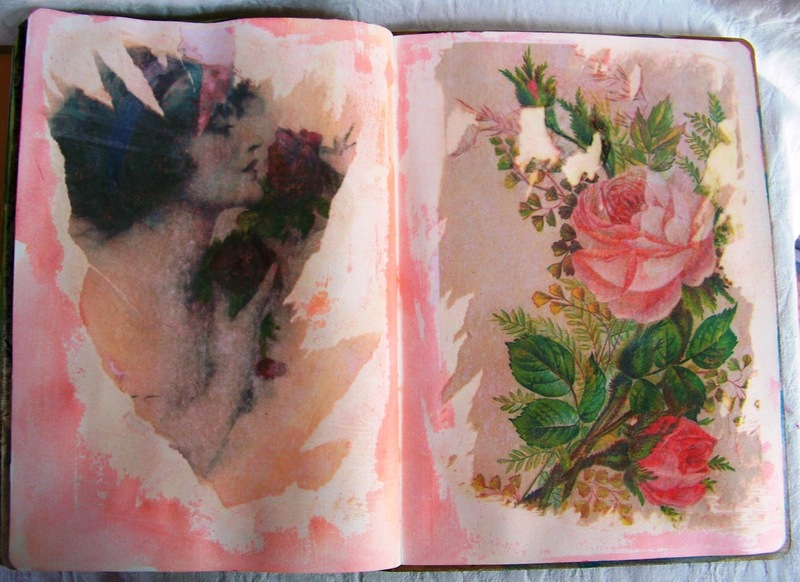 It is amazing to see the end result after viewing the image transfers on the plain pages. The gorgeous vintage lace is the pièce de ré·sis·tance and how wonderful that it came from your grandmothers collection. 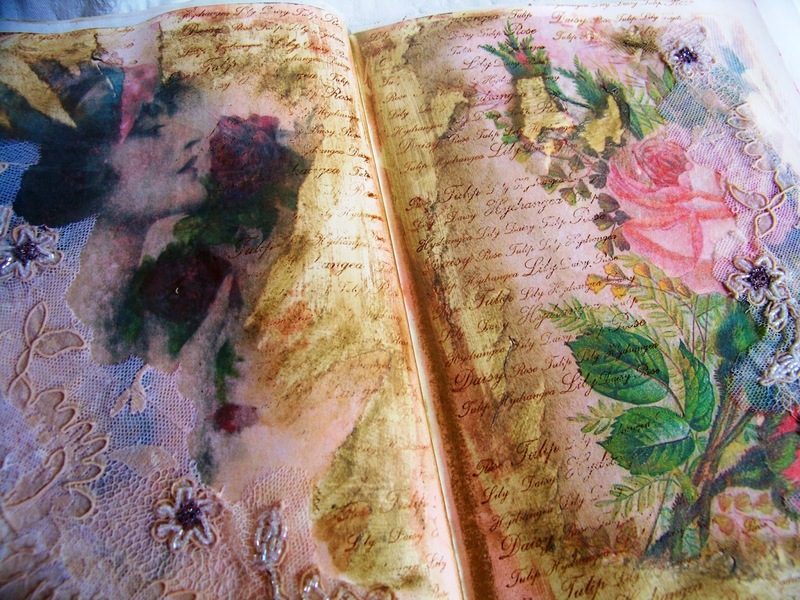 Oh my giddy aunt Donna Marie.. it`s like a time worn work of art...stunning work and such lovely detail! !